I am so excited! This is going to be the best summer vacation ever thanks to Seymour’s words of inspiration. I never would have imagined that I would become Seymour Simon’s new Youth Environmental Reporter, but here I am. One of the luckiest 10 year old kids there has ever been. 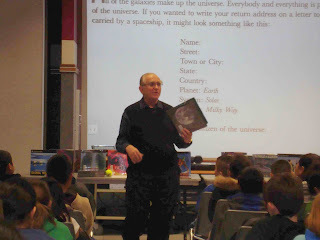 I get to work with and write for my favorite children’s author, Seymour Simon, while doing what I love the most. Helping to “Save the World!” Yes, you heard me right…I am going to “Save the World,” well, at least I’ll be doing my part by trying to. I want to know that I have made a difference on our planet because this is OUR PLANET and OUR FUTURE. We share this planet with all of the other creatures that live here including the Earth itself, but for some reason humans continue to destroy this beautiful world. So this summer I will be setting out into my local community to do environmental research and reporting. That might sound boring, but it’s totally not! I am going to have such wonderful adventures this summer. Oh, I forgot to mention the coolest part. I have started a group called “KIDS TODAY FOR A BETTER TOMORROW.” This group includes all my friends and a ton of other kids from Southern California. (That is where I am from) We are going to have a blast. Not only will I get to hang out with all my friends this summer, we are actually going to be doing something amazing…we will be out improving our community and saving the planet at the same time. Isn’t that so cool? So you might be wondering how this all came about. Well, I was really sad about the Gulf oil spill. My mom and I had been watching the daily updates. It broke my heart to hear about what was happening. All those poor sea creatures and the beautiful ocean were being ruined because some adults didn’t make sure to properly plan ahead of time. (You know how at school we practice for earthquakes, or tornados, hurricanes, and all that type of stuff? Our teachers have us practice for these types of things so that we will be prepared in case it actually happens.) Well, this oil company did not prepare for a spill, which is so crazy. Well, anyhoo, when I went to school we were reading a story called “Wildfires” by Seymour Simon. I really liked the book and how it was easy to understand so I wanted to learn more about the author. I found out he had a website www.seymoursimon.com. MR. SIMON GOES TO WASHINGTON! 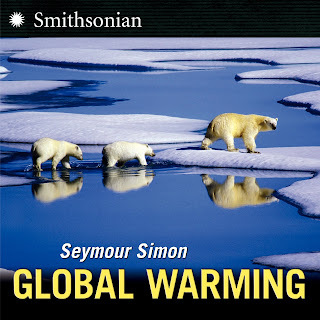 This past Saturday, April 17, Seymour Simon was invited to read from his GLOBAL WARMING book as part of the The Climate Rally on the National Mall in Washington, DC. The stage was placed directly in between the Capitol Building and the Washington Monument, so it was quite an honor to be on the program! "There is a Native American proverb that powers and informs the reasons and ideals of our approach to the problems of climate change and global warming. I was a teacher in the New York City School System for nearly 25 years. I’ve written over 250 books for children about animals and the wonders of Earth and Space. Each year, I speak to thousands and thousands of children in schools in all parts of the country, in the South to the North, from East to West. I tell them about butterflies and polar bears, I talk to them about lightning and tornadoes; I take them on a journey from Earth to the ends of the universe using the words and images in my books. I’ve written books about nearly every science and nature subject you can imagine. "Knowledge empowers people with our most powerful tool: The ability to think and decide. There is no power for change greater than a child discovering what he or she cares about." By the way, does anyone know the name of the red brick building in the background of this photograph? It’s the Smithsonian Institution - how appropriate a setting for Seymour’s Earth Day speech! Global Warming was a hot topic for kids, families and classes in 2010. In this article, Seymour talks about how to demonstrate the greenhouse effect to kids, and what your family can do to reduce your own impact on climate change. My new book, GLOBAL WARMING, is in the stores this week. Whenever I write about a new topic, I like to share project ideas and discussion starters that parents can use at home, or educators can use in the classroom. Almost all scientists think that Earth’s climate is getting hotter. We call that Global Warming. Scientists agree that the burning of fossil fuels like oil and coal cause greenhouse gases to escape into the air and that these gases are causing most of the warming. We call that the greenhouse effect. Another cause of global warming is deforestation (cutting down trees). Trees take in carbon dioxide, one of the greenhouse gases, from the air. The more deforestation, the greater the greenhouse effect, and the more global warming speeds up. Here’s how you can demonstrate the greenhouse effect with children. Take two quart-sized plastic containers or glass jars. Put two cups of cold water in each jar and add two ice cubes to each container. Put one of the containers inside a large plastic bag and seal the bag (the plastic bag acts like the atmosphere around Earth). Leave both jars in a sunny spot for one hour. Measure the temperature in each jar. In sunshine, the air inside a greenhouse becomes warm because the greenhouse glass allows the sun’s light energy to get inside and then change to heat. The heat builds up in the greenhouse, in the same way that heat builds up inside Earth’s atmosphere. You just showed a small greenhouse effect. You can also see the greenhouse effect in an automobile parked in the sun. The sun’s light gets inside the car and the heat is trapped inside, like the plastic bag around the jar. Most scientists say that the burning of fossil fuels is increasing the greenhouse effect and speeding up global warming. Since these fuels are burned for energy, and everyone uses energy, everyone can help stop global warming simply by using less energy. Think about the things you do each day that use energy. The lights in your house use electricity. The TV and computer use electricity. The washing machine, dishwasher and dryer all use gas or electricity. Every time you ride in your car, it uses gasoline. We can’t stop doing all those things, but here are some things that we can do. 1. Wait until you have a lot of clothes or a lot of dishes before using the washing machine or dishwasher. Don’t use the washing machine for just a few pieces of clothing or a dishwasher for just a few dishes. 2. Turn off the lights when you leave a room and don’t leave the lights on all night long. Use energy efficient fluorescent bulbs instead of high-energy incandescent light bulbs. This discovery, of a solar system similar to ours, was big news in 2010. A very exciting discovery was announced today at the Observatoire de Haute-Provence, France. Astronomers have detected a planetary system containing at least five - and maybe seven - planets that orbit a star called HD 10180, which is much like our own Sun. They say this is the "richest" system of exoplanets - planets outside our own Solar System - ever found. Up until now, astronomers had known of fifteen systems with at least three planets, but never one that was this similar to ours in terms of the number of planets (seven as compared to the Solar System’s eight planets). The team also has evidence that the distances of the planets from their star follow a regular pattern, as also seen in our Solar System (this is known as the Titius-Bode law). The star is 127 light years away, in the southern constellation of Hydrus. Researchers used the HARPS (High Accuracy Radial velocity Planet Searcher) instrument at the European Southern Observatory to monitor light emitted from the system. The lead author of the paper, Dr. Christophe Lovis, explained how the planet searcher works. "If there is one planet it will induce a little movement - the star will come towards us and move away….and what works for one [planet] works for many." Using HARP, Dr. Lovis and his team were able to measure this complicated mix of movements and break it down into individual planets, calculating the mass of each planet and the path of its orbit. Martin Dominik, one of the researchers on the project, told reporters why this discovery is so important to us here on Earth. "[This] marks the way towards gathering the information that will put our own existence into cosmic context." I have been an amateur astronomer all my life, and was President of the Junior Astronomy Club at the American Museum of Natural History when I was in high school. I love science news stories like these - I guess that is why I’ve written as many books as I have about space. Kids can read more about stars and the exoplanets that orbit them in my book STARS. The first photograph shows a close-up of the sky around the star HD 10180. The picture was created from photographs taken through red and blue filters and forming part of the Digitized Sky Survey 2. Provided courtesy of ESO. The second image is an artist’s impression of the new solar system, also courtesy of ESO. In today’s entry, Seymour wrote about an environmentalist that he deeply admired. Richard Pough, founder of the Nature Conservancy, died on June 24, 2003. Pough’s efforts as a nature conservationist led to the establishment of numerous wildlife sanctuaries across the country. He also wrote the Audubon Bird Guide, and led the fight to ban the sale of the feathers of endangered birds (whose feathers were prized in those days as ornaments for women’s hats). Pough was one of the first people to raise the alarm about a pesticide that was threatening the wildlife in a way never seen before. According to a 1945 article in the New York Times, Pough reported on tests by the Audubon Society and the United States Fish and Wildlife Service showing that forests in Pennsylvania had lost their birds after being sprayed with DDT. ‘‘If DDT should ever be used widely and without carewould have a country without freshwater fish, serpents, frogs and most of the birds we have now.’’ Rachel Carson’s more widely recognized book on this same subject, ‘‘Silent Spring,’’ was not published until 1962. Pough began his conservation career in 1932 when he heard about a hunting spot called Hawk Mountain near where he lived in Philadelphia. He went to investigate, and was horrified to find hundreds of dead hawks. He eventually stopped the hunting when he persuaded a wealthy New Yorker to buy 1400 acres of the land on the mountain, establishing the country’s first sanctuary for birds of prey. If you have ever seen one of these glorious raptors soaring in the wind drafts and thermals over a verdant valley, you will know why he was moved to action. Richard Pough is also very close to my heart because later in his career he became the Chairman of Conservation and General Ecology for the American Museum of Natural History. While in that position he oversaw creation of the Hall of North American Forests, which includes a realistic diorama of Stissing Mountain, in the Hudson Highlands in Upstate New York. As a little boy growing up in the city I used to sit in front of this diorama and imagine living in a place with a big lake, soaring hawks, supple white birches, and leaping bass. Many years later, I am fortunate to own a house not 20 minutes from that very spot. I have always strived to be an active conservationist and environmentalist, and I was inspired by the work of people like Richard Pough. This entry explains a favorite topic of Seymour’s - how to write your address as a citizen of the Universe! I was recently in San Angelo, Texas, where it was cold and raining and everyone was very happy about the weather. When you live in a drought-prone area like West Texas, I can understand why rain is a welcome event! We (my wife Liz Nealon went with me) discovered that although San Angelo is a rather small city, there is a lot to see there. We visited the San Angelo Museum of Fine Arts, which is a gorgeous building with a permanent ceramics and silver collection that we enjoyed very much. We had lunch in historic San Angelo, at a restaurant called Miss Hattie’s Saloon, which had…let’s call it a "colorful" history in bygone days! And, we visited Fort Concho, where Pecos Bill was once the commander. The fort is a National Historic Landmark because it was the the home of the Buffalo Soldiers who were part of the 10th Cavalry, one of the two all-Black cavalry regiments who protected the Great Plains in the mid-1800s. I was in San Angelo to speak at the 8th Annual Literacy Conference, held at Angelo State University. While I was there, I also spoke to a number of large groups of kids from the public schools in San Angelo. Here is a picture of me with a group of students from Holiman Elementary. The kids were all bright, eager, and very smart. I told each group a story that is in one of my early books, THE LONG VIEW INTO SPACE, about the way I started writing my return address when I was their age. Here’s how I did it. Years ago, when this book first came out, I was on my way to visit a school in Ohio. I got a letter from a fifth grade boy who had been looking at this address, and told me that I forgot to put down the zip code for the universe. I asked the kids in San Angelo if they could guess what he thought the zip code for the universe should be. A student came up with the answer in every group I spoke to. They suggested that the zip code for the Universe should be ∞ - the symbol for infinity. Try writing your complete address. You are truly a citizen of the universe (and make sure to include its zip code). This year saw many changes at NASA, which Seymour wrote about in early May. Many of us were dismayed when President Obama recently announced cuts to NASA’s budget. Although everyone understands the need for austerity in these troubled economic times, I am always in favor of invention and exploration - one of the best attributes of American culture. This Friday, the space shuttle Atlantis is scheduled to make its final launch, undertaking a 12-day mission to the International Space Station to replace solar panel batteries, install a backup antenna and attach a Russian module filled with supplies. After the Atlantis mission, the other two shuttles - Discovery and Endeavour - are each going to make one more flight, and then all three will be retired. Maybe it’s because I was an impressionable 8 years old when President Kennedy gave his stirring "We will go to the moon….." speech. Or because I used to set my alarm to get up and watch the shuttle launch when my friend, Navy Captain and astronaut Dan Bursch flew one of his four missions. Danny shares the U.S. space endurance record with astronaut Carl Walz - 196 days in space! (his kids still remember this milestone because he missed Christmas and several birthdays - even an astronaut is still just "Dad" when he gets home). So, despite its flaws, limitations, and several tragedies, I felt very sad when I heard the Shuttle program was being discontinued. The good news, reported in today’s Science Times, is that we’re continuing to train astronauts for exploration of other planets…..we’re just not doing it in space! Yesterday marked the beginning of the 14th NEEMO (NASA Extreme Environment Mission Operations) mission. A crew of six, led by Col. Chris A. Hadfield, a Canadian astronaut who flew two shuttle missions, descended 65 feet to an underwater laboratory off the coast of Florida, where they will practice the skills required for setting up a habitat on another planet. By adjusting the buoyancy of the diving suits, the aquanauts can go about their work feeling as if they are walking in the one-sixth gravity of the Moon or the three-eighths gravity of Mars. And, they have set up a 20-minute time lag in communications with their mission controllers on the surface, just as they would have if they were trying to get advice or help in solving a big problem while on Mars. Click here to read the entire story about how these aquanauts are developing the skills we will need for future space exploration. It’s not over yet! Seymour makes a new "friend" in today’s entry. Merry Christmas, everyone! People often ask me if I personally shoot all the photographs in my photo-essay books, since both words and images are so important in telling the story. The answer is that although I use my own photographs whenever I can, often the subject matter demands photographs that can only be had from specialists. For example, books like PENGUINS or the forthcoming BUTTERFLIES include photos by professionals who have literally spent years observing and photographing these animals. Part of what I do when I’m writing a book is photo research - scouring the archives to find photographs that I believe will best illuminate and in many cases expand on the text. Sometimes, if I find a photograph that is interesting enough, I will even rewrite the page to go with the photograph. It is a fluid process, writing and doing photo research, and one that I really enjoy. I do, however, photograph nature and animals often….pretty much every week I find one day when I can get away from my desk and spend time in the outdoors with my camera. We recently visited an alpaca farm in Columbia County, NY, and I found these animals to be irresistibly photogenic. The bangs hanging over their eyes certainly enhance what are already quirky, expressive faces! We often are tempted to assign human emotions to animals…..like thinking that this little guy is looking at me quizzically. The fact of the matter is, when you get close to an alpaca, it often summons up green liquid (from chewing its cud) to spit at you. Spitting is how they stake out their territory, as well as reinforce the pecking order in the herd. Unfortunately, when an alpaca is sucking on partially digested grass, he often gets a bad case of sour mouth. So, although I’d like to tell you a lovely story about how this young cria (pronounced "cree-ah," the Spanish word for baby alpaca, commonly used among English-speaking breeders, too) and I established a wonderful relationship, the truth is he was just letting me know I was getting too close to his territory! Between now and the New Year, we are going to re-run 2010’s Top Ten postings from the Seymour Science blog so that we can share some of this year’s best writing with our newer readers. Today’s entry is a column in which Seymour talks about how he decides what to write. People often ask me how I choose the subjects for my books. Titles come about in all sorts of ways. Sometimes it is simply a topic that I am very passionate about (hence all my books about Space and exploring our universe - this has been a fascination for me since I was a little kid). At other times, my editor and I decide what is needed to "fill out" an existing series. For example, my recent Collins/Smithsonian books have been dealing with environmental topics like Global Warming and Tropical Rainforests, and now I’m just beginning research on a third topic for that environmental strand, about Coral Reefs. Often, I will decide to do a book simply because it is on a topic that I know kids will love. I’ve just finished up a new book with my good friend, the illustrator Dennis Kendrick. It’s called Silly Dinosaur Riddles, and it hits two enduring hot spots for elementary-aged kids — they love dinosaurs, and they love to tell jokes and riddles! So, deciding on that topic was easy, and we’re delighted with the way that it came out. It’s also going to be my first original eBook - designed to read on a smartphone, an iPad, or any other tablet reader. More and more schools and libraries are buying these devices to use with kids, and I’m excited to be creating books that children can read on one of these new readers. Back in 2002, I wrote two books that I knew my young grandsons would love — Seymour Simon’s Book of Trucks, and Seymour Simon’s Book of Trains. One of the very nice things about writing for children is that books have long lives. Every three or four years, you get a new crop of kids who grow into the topic or reading level, and fall in love with your book all over again. That happened this week with my Book of Trains, when I discovered this lovely review by Frances Loving, a librarian who writes a thoughtful blog called Quiet Ramblings. The book may be almost ten years old, but it’s clearly still relevant for her students! Click here to read her review. I always like to hear from readers, parents and teachers. If there is a topic that you’d like to see me cover, drop me a note here and let me know! Between now and the New Year, we are going to re-run 2010’s Top Ten postings from the Seymour Science blog. We have so many new readers, we want to share some of this year’s best writing. We’re starting off with a favorite in which Seymour writes directly to kids about wanting to become a writer. Here is an excerpt from a lovely note and photograph that I’ve received from Renonia West, the librarian in Miles, Texas. We met when I spoke down there in February. I am the librarian in Miles, Texas. I just wanted you to know how much I enjoyed listening to you at the Literacy Conference in San Angelo. 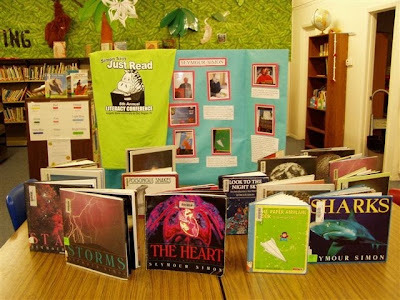 I came back to school and made up a center featuring your books, with pictures. The kids loved all the stories that you told about flying the paper airplanes out of the window in New York, and your going up in the plane in Alaska. 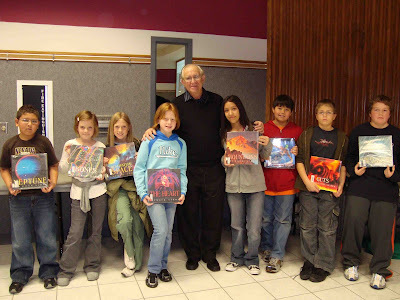 I have really been encouraging all the kids to write and be authors, so I told them about you writing your first book about space aliens, in elementary school. Also they were thrilled to see your autograph in two of our books that I brought for you to sign. The kids have really been reading your books especially the "Hidden Worlds" book. I hope you enjoyed your extra day in San Angelo. We actually had some snow here on Tuesday! I love it that Ms. West is encouraging all her readers to be writers, as well. My "first book" that she refers to was indeed titled SPACE MONSTERS, and I wrote it when I was in second grade. If you want to be a writer, the most important thing to do is write as often you can. Just as athletes begin playing sports when they are kids and grow into professional athletes, writers also begin writing when they are kids and grow into professional writers. If you want to be an Olympic hockey player someday, you join a team and start going to practice early every morning. If you want to be a writer, get yourself a blank notebook and start writing every day. And you don’t have to get up at 4am to do it! © Seymour Simon. All Rights Reserved.